Measuring 17.5 by 22.5 by 1.5 inches this black Lineco Museum Storage Box is ideal for protecting important documents, delicate papers, photographs and artwork. Featuring a drop front to conveniently retrieve valuables, each box is constructed with a buffered 60 point board that is reinforced with metal edges. Both acid and lignin-free, this archival storage box will protect against acid, airborne pollutants, light and dirt. Holds documents up to 17 by 22 inches. 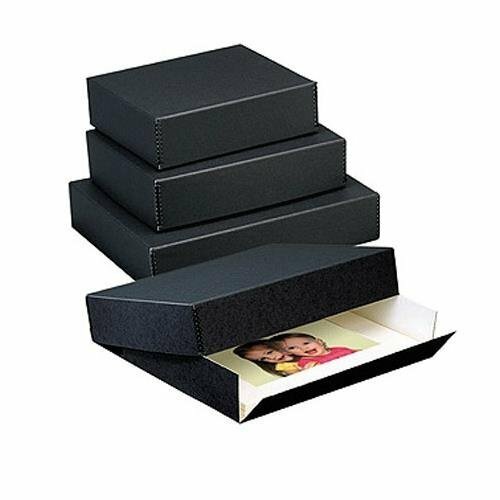 Adorama Archival 18X24" Print Storage Box, Drop Front Design, 18 1/2x24 1/2x1.5"
Century Archival Products Elite #1223 Storage Print Box, Size: 16x20x2", Color: Black. Lineco Archival 14" x 18" Print Storage Box, Drop Front Design, 14" x 18" x 3", Exterior Color: Blue / Gray.